-----The Cumberland and Tennessee Rivers run parallel courses for their last few hundred miles. The end of their journey from the Appalachians to the Ohio River is a due north course. It takes a cruising boater a while to adjust to the fact that down river is up map. Not many rivers in the United States follow such aberrant behavior as to flow north - the St. Johns, the Willamette, and a very few others. Then, there is the odd fact that the Kentucky and Tennessee Rivers could greatly shorten their courses if they merely flowed westerly - into the Mississippi instead of northerly to the Ohio. -----Their odd route is a great advantage to cruising sailors. The government built two large dams, one on each of the rivers, about twenty miles upriver from their junction with the Ohio. 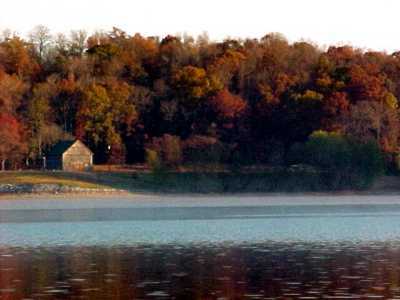 The resulting two parallel lakes, Kentucky Lake on the Tennessee and Barkley on the Cumberland, extend over one hundred miles south from the dams. A few miles upriver from the dams, the government conveniently built a canal connecting the two lakes. What a spectacular play area this is - miles of interconnected lake water and two rivers. 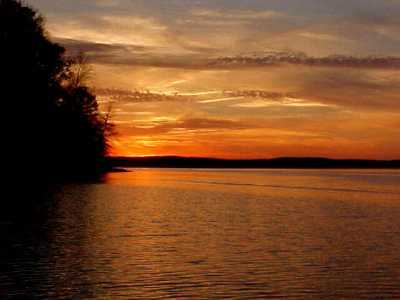 The federal government manages The Land Between the Lakes. This is a marvelous parkland. It is one of the nation's largest peninsulas, over forty miles long and about 5 miles wide. JFK set it aside in 1963. -----We splashed into the waters of Kentucky Lake - excited and eager for the prospect of cruising a thousand miles on the storied waters of the south. -----We all make mistakes. It gets even worse as we age. We tend to forget things. 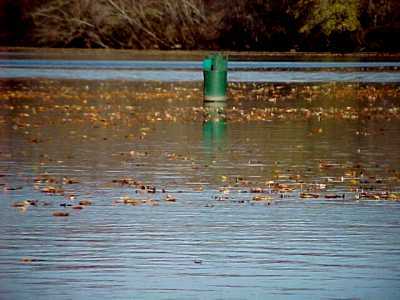 At Old Hickory Lock and Dam, Mr. Bill made a mistake and we were forgotten. -----The day had gone well. 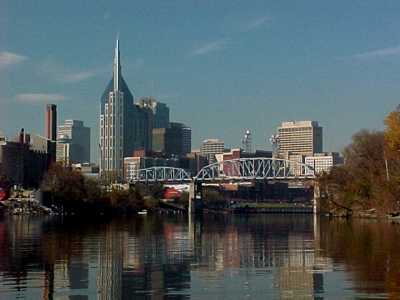 We had a nice cruise up the Cumberland past the impressive skyline of Nashville. 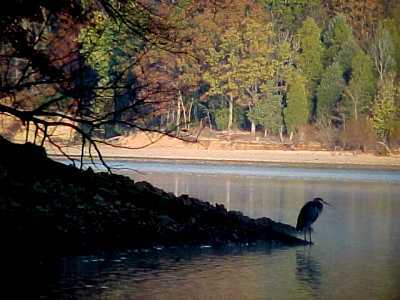 The dull golden browns of fall trees lined the shores, with the occasional highlight of gold. "New England, it isn't," El observed. -----"No argument, hon." She was certainly right. The oaks of the south just don't have the vivid brightness of the maples of the northeast. "But the sun is warm, the sky blue, the air is light, and we're on the river cruisin' new water. Doesn't get much better, does it?" -----She agreed, it doesn't get much better. Then, things got a whole lot worse. There is very little barge traffic in this section of the Cumberland. We hadn't seen one made up and moving all day. Just a few light boats scuttling around barges tied to shore in Nashville. They were as busy as mother hens with their chicks. -----We were five miles below the Old Hickory Lock and Dam, one of the Corps operations controlling river flow and generating power along the Cumberland. It was about three in the afternoon and El had a great anchorage chosen just nine miles above the lock. After a day of concentration - dodging logs, finding navigation marks, and just plain absorbing lots of marvelous scenery - we are tired in the afternoon. We relish the hour before sundown, sitting in the cockpit visiting and sipping on our sundowner as we watch daylight fade softly into gathering dusk. Our timing was perfect for that anchorage. -----El was just reaching for the VHF to announce our imminent arrival to the lockmaster, when channel 13 started squawking. "Mr. Bill, this here is Ray Gee. We got youh lock in sight and figuh yo'all bettah git to wok." -----We had traveled over sixty river miles without a tow on the river, and had the good fortune of coming up on one just below the lock! Well, life is like that. Just because things can't get any better, doesn't mean things can't get a whole lot worse. We neared the lock and sure enough, there was the Ray Gee, a shiny white tow pushing a load of six barges mounded high with coal. We had passed her way down river a few days earlier, but like the hare and the tortoise, she plodded along day and night and slipped ahead while we slept at an anchorage up a side creek. -----"Old Hickory Lock. Old Hickory Lock. This is Halcyon." El hailed the lockmaster on 16 to let him know we were there on the river below the big tow. Ah, switch and answer on 14, ma'am." 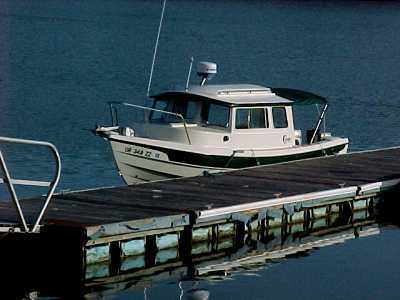 There's a good reason to name your boat a simple name - like Bubba Gump, or Ray Gee. Maybe, in this part of the world, Jack Daniels would be a good name. We knew Halcyon might be a bit of a problem, but we enjoy the name and it's meaning too much to be overly concerned about it's clarity. -----"Old Hickory. This is Hal---c---yon on 14," El answered Mr. Bill. -----She turned to me, smiling. "Sounds like the name of a tow when we say it that way, doesn't it, Bill? Hal C. Yon." -----"Yes'm, ah hyah yah. What kin ah do foh yah, ma'am?" Mr. Bill is certainly from Tennessee. -----"We are just below the Ray Gee, upbound, and would appreciate a lift up as soon as the lock is clear," answered El. -----"Yes'm, yes'm - that'll be no trouble. Ah'll take yah jist as soon as ah kin. Looks like 'bout an hour and a half." -----"Old Hickory. This is Hal C. Yon. Thank you, sir. We'll be hanging out down here waiting. Hal C. Yon clear and back to 16." El put the mike back on the hanger. She's a great radio operator, and we have found that a woman's voice gets attention from the male-dominated world of marine radio. She's had long chats with towboat captains on the VHF. It can be a lonely life, with days away from family and home. El's interested in their jobs and their lives, and they love to visit with a friendly voice. -----"Well, that's not too bad," El said. "We should clear the lock with just enough time to get to the anchorage before sundown." 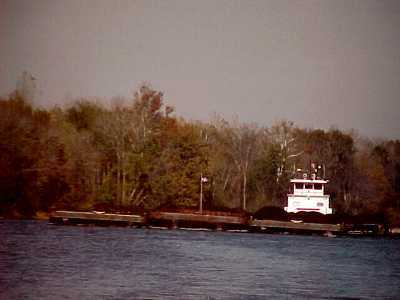 -----Ray Gee had to break up the long string of barges to fit into the lock. That takes time and work. It's an interesting process to watch. 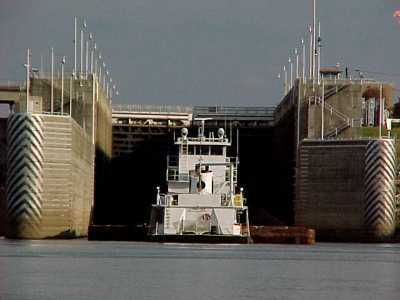 Men scurry up the hundred-foot high ladders inside the lock like ants crawling out of a box, and the tow skipper jockeys the barges with the same care you exercise as you park your car in a tight garage. We watched in fascination as we idled in the tail water below the dam and lock. The first set of barges was soon tied off to the lock wall, the tow scuttled back, and the giant doors slowly closed. We listened to the words exchanged on the VHF between crew and skipper, as the well-choreographed ballet took place in front of us. 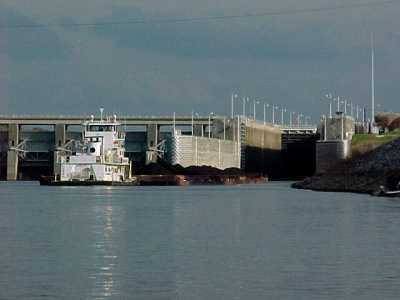 The front barges were locked up, winched out of the lock, and secured to the giant cells above the dam. Then, Ray Gee pushed in the remaining barges before him and they all disappeared behind the lock doors. The VHF crackled with the buzz of information as the crew reassembled the barges into a string ahead of the Ray Gee. -----We patiently waited as the sun sank lower toward the western ridges. The VHF fell silent. The downstream light on the lock shone bright red. We assumed the lockmaster was emptying the chamber and would eventually reopen the doors for us. Nothing. A half hour more slipped by, easily enough for the lock to be empty. The sun sank behind those hills. ----- Suddenly, we noticed a change. The red light was turned off. Now, you don't want to tell a lockmaster how to do his job. Or try to push them into moving faster. "Pleasure" boats are on the bottom of the pecking order in a government lock - like a gnat or mosquito on an elephant's hide. But, finally, as darkness fell around us, El called Mr. Bill. "Old Hickory Lock. Old Hickory Lock. This is Hal C. Yon still waiting for a lift up." -----"Whar are yah, ma'am? Ah looked everywhere and can't see yah," drawled the VHF. -----"We're right below your gates, where we've been for the past three hours," El said with barely disguised impatience. -----"Why, Ah've bin a looking, an' I done see yah no whay-uh. Ah thot yah musta done gone home, or sumpin." -----"Nope, just waiting here below the lock," El said with an edge of irritation beginning to show. -----"Below the lock? BELOW THE LOCK? Why, Ah thot yah sayd yah was above the lock. Ah saw that lil' boat below, but thot yah was a fisherman. Mah stars, in thuty yeahs of locking, Ah nevah lost no boat befoa. Hang on, ah'll spill the watah as fast as Ah kin." " He stood beside the rail and tossed a cheery wave and we slithered out into stygian nothingness. -----We had nine miles of darkness to the first safe anchorage. A few lights flickered from houses ashore. We passed a barge sweeping his twin beams through the night. Far off in the distance, on the dark shoreline, was the cheerful blinking of a single red nav light. We crept ahead, all the windows open. At night, ears are almost as important as eyes. El held the Q-beam ready to sweep the darkness for anything forward. The radar hummed overhead. 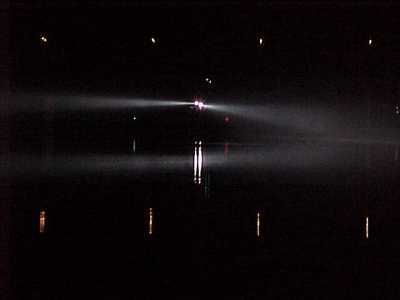 The black screen, in video mode, showed the shoreline glowing irregularly on the margins. According to the chart, there should be a can and a nun about a half-mile ahead. Two small white dots faded in and out at about that location on the radar screen. We hoped they were the marks. My eyes were riveted on the radar and GPS Chartplotter and I sailed a course to place us between the dots. El's eyes were the outside eyes - night adjusted, she peered into the darkness. When the dots were a few hundred feet ahead, 45º off the bows, I closed my eyes, and she swept the beam - sure enough, she said, there they are. What a relief to have her visual confirmation of an electronic spot! For the next two hours, we moved from dot to dot. My eyes were only on the instruments; El's were ahead with the 'Cajun radar,' so called by a tow captain El met on the radio along the Louisiana coast. her Cajun radar lit an object almost as big as our boat fifty feet ahead. A great mossy chunk of Styrofoam! -----Hearts pounding, we continued creeping the white dot trail. Finally, our cove split the port shoreline into a deep inverted V - Stark Knob cove. We left the dots, and slowly moved toward the black V outlined by white shoreline on the radar. The depth sounder showed bottom rising abruptly when we left the old river channel beneath the lake water. 25, 20, 10 feet - the sounder gave five insistent beeps warning of the shoal, the former terrace of the river. Our eyes were riveted on the dark line of bottom rising beneath our boat on the screen. Sharp peaks occasionally rose from the dark line, outlining stumps of the drowned river-bounding trees. El swept the blackness ahead with her beam, trying to discern a black tree trunk out of the black night. The sounder leveled at eight feet, and then, after what seemed an eternity, the bottom slowly descended and showed black and solid again. We moved into the apex of the V until the sounder showed five feet, dropped the hook with the windlass, and backed off until we felt the reassuring tug. Now, Mr. Bill, we had finally "done gone home, or sumpin." -----The Cumberland is, in the daytime, a delightful cruise. There are so many outstanding contrasts - Civil War battlefields and forts and peaceful anchorages. 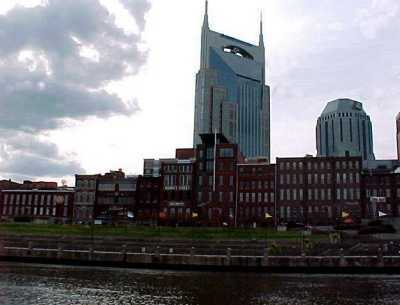 Nashville and farms. Opryland and owls hooting. There's even the Castle on the Cumberland, a maximum security Kentucky state prison, where more than 150 have been put to death. 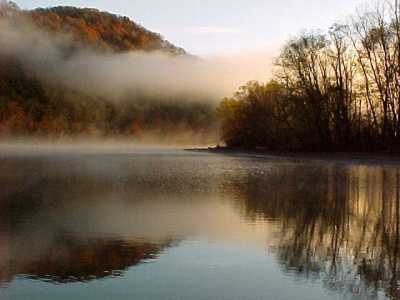 -----Early on a mid-February morning in 1862, others cruised up this river in the morning mist - a Union navy. Four ironclads, two timberclads, tugs, troop transports and a hospital ship attacked the Confederate army entrenched at Ft. Donelson. -----In the early days of Earth history, meteor impact scars pocked the land surface everywhere. Slowly, as the gravitational vacuum cleaner of our increasing mass swept our orbital space of all rocks, few meteors remained to strike. Active erosion erased the evidence of impact and such sites are hard to find, now. In the process of mapping one in Utah, I read the geological literature of all then-known or suspected terrestrial craters. 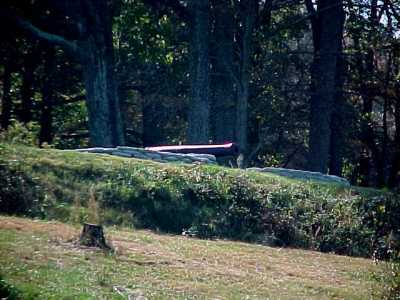 A large circular feature, with a central mound, had been mapped in Tennessee and was thought to be an ancient impact scar. Aboard Halcyon, we cruised through the 'crater.' The usual horizontality of the limestone beds bounding the river was disrupted by the impact of a meteor perhaps miles in diameter. 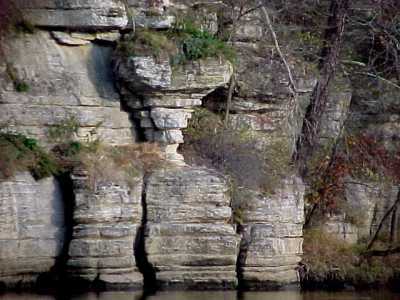 Limestones were contorted along the edge of the river, as though writhing from the cosmic blow. Our imaginations swept back to that long ago event. -----Limestone is tough - it defies erosion, and the horizontal layers stand as a resistant plateau, the Highland Rim, challenging the scouring of wind and rain. 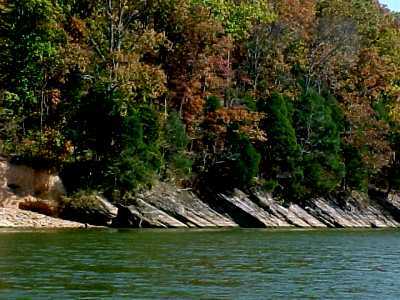 The Cumberland River etches downward along cracks or weaknesses in the limestone. 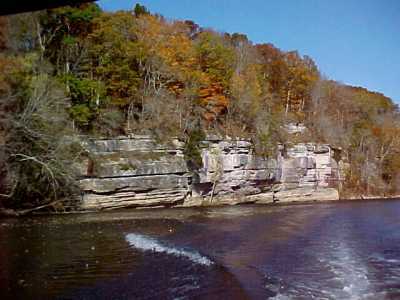 As we cruised upriver, we passed Sydney Bluff, 315 feet high, and dropped off the Rim into the Nashville Basin. This lowland is some of Tennessee's richest farmland. -----We heard tales of the restaurant at Cherokee Resort, on Old Hickory Lake. "They go through more than two thousand pounds of beef in a week," said the man who looked like he had consumed his share. "Gotta stop there," he added. We did. The roast beef dinner and the steak were outstanding - no wonder they "go through" a ton of beef. -----The farther upriver we cruised, the smaller and more intimate it became. We went by the Hartsville nuclear power plant, abandoned in 1985 after the TVA spent more than a billion dollars in her construction. 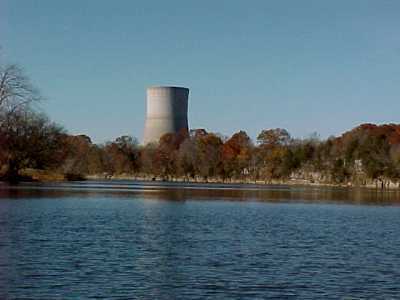 After it was built, they determined the cost of its power would be uncompetitive. It sits, in deserted glory, the apex of a web of high power transmission towers built to carry electricity never generated through wires never strung. White strobe lights still blink off her characteristic jug-shaped concrete cooling tower. What a waste. 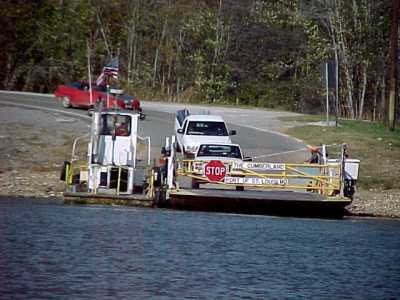 -----El radioed Cordell Hull lock and he had the gate open for us, ready to lift. Maybe Mr. Bill had relayed word up the river about Halcyon. The last tow and barges came through this lock years ago. They used to haul oil downriver to a refinery, the lockmaster said, but then they built a refinery near the oil. They also hauled coal down to the power plants, but the coal in the Cumberlands is too high in sulfur so they no longer haul it. "Nothing hauling any more except pleasure boats," he said. So, he lifted us up the 59 feet and we cruised out onto Cordell Hull Lake. Pretty country. The local cruising guide says this area is called the 'Switzerland of America' - maybe it might look like the Alps by local folk who never left the valley, but the Alps it is not. The 'mountains' looked like knobs to us. However, it is a most beautiful area that doesn't require comparison. They were covered with the copper of fall, and were reflected in the blue water of the lake. -----That night, we were hooked in Sandy Chapel Cove. El went out to the cockpit, before heading to bed, for a last 'goodnight' look around the anchorage. She suddenly burst into the cabin, "WOW!" was all she could say, her face lit up with excitement. I followed her outside. 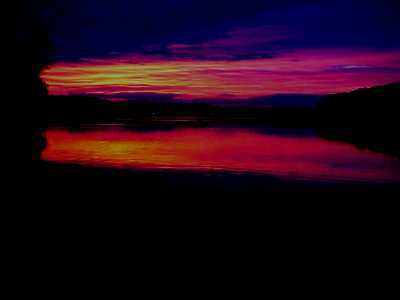 -----She pointed to a deep red glow filling the northern sky - an aurora! Incredible, this far south. The entire northern horizon had a distinct red glow that extended upwards half way to the zenith. Several white beacons moved within the redness, first, on the left, then the right, then the center. The entire glow spread like wine spilled in the northern sky. It would diffuse then converge - repeating the show. Beautiful! What a way to end a beautiful day on a beautiful river. The next day, at the head of navigation, Celina Bridge, we reluctantly turned our bow downriver.